Okay yall, I think this hands down may be my favorite thing I have made this year. 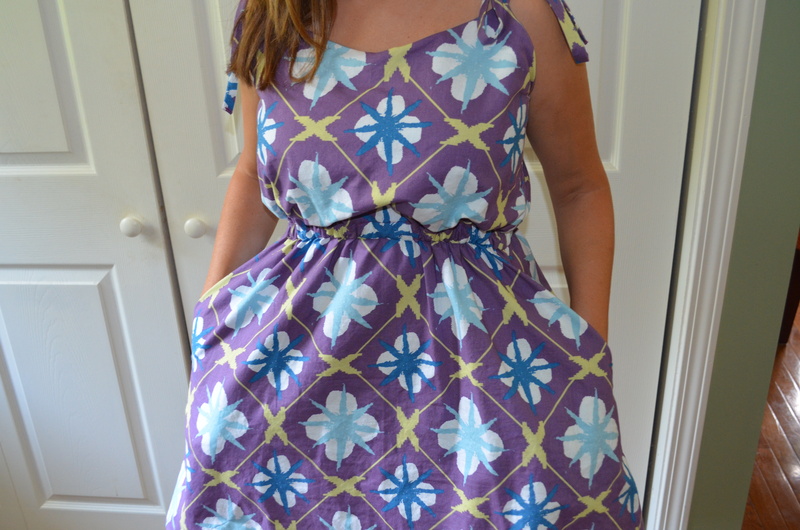 This is the new Saltspring dress from Sewaholic and it is the best pattern ever! Ironically I was kind of meh about the pattern when it first came out so I was hesitant to take the plunge, but then I kept seeing so many adorable Saltspring dresses pop up on the blogosphere. I love the tie straps and the pockets, and the elastic waistline is super comfy! This dress was super easy to make, I didn’t even really follow the directions too closely to be honest. This dress has a self lined bodice, with the lining being slightly shorter than the bodice fabric to create a billowing effect. I used a heavier cotton material from Hawthorne fabrics, this was actually a quilting cotton but after a run through the washer it softened up nicely and got a nice flow to it. Since the cotton was heavier I didn’t want the top to billow out as much so I took off about an inch from the bodice piece. I also made a bigger channel for my elastic to create a more defined waistline, and I eliminated the zipper. With the extra room and stretchiness from the elastic, a zipper seemed a little too fussy and unnecessary. And POCKETS! Nice roomy pockets. Love!! 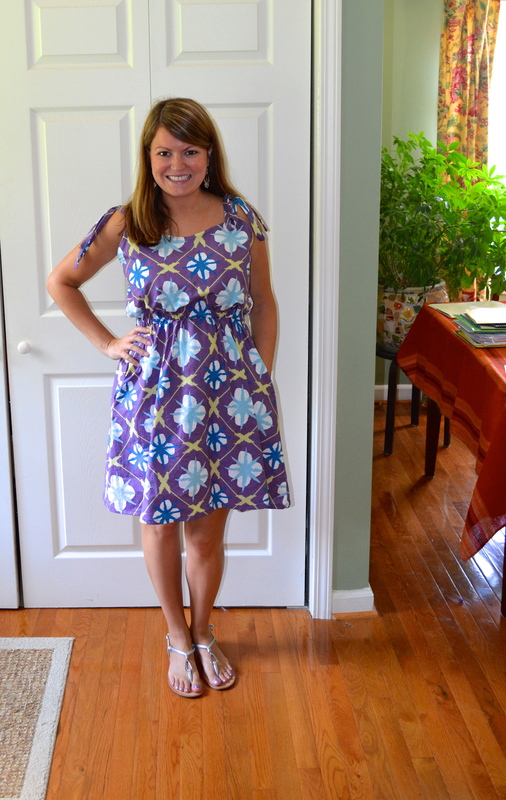 I wore this dress to my brother in law’s 30th birthday party and I had two requests for versions of this dress. I think it is one of those patterns that looks good on everyone, and makes you feel good. 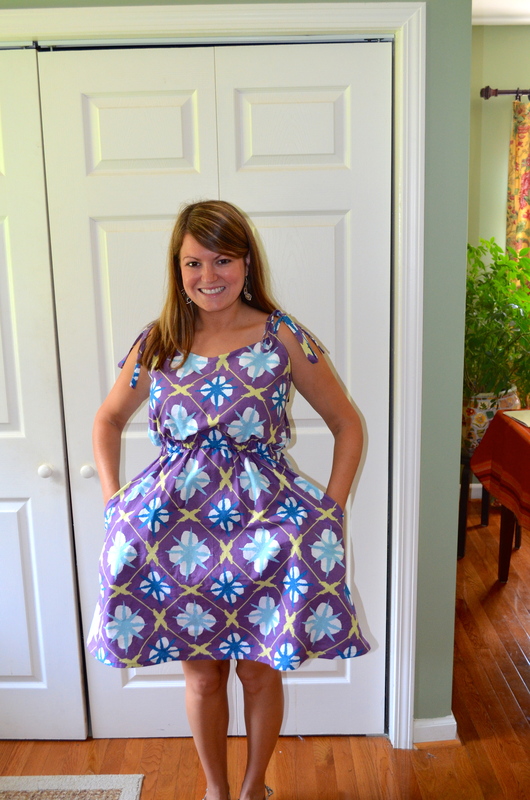 It is easy to wear and can be made in a variety of fabrics. I think I may try it out in a knit if the right one comes along. I also wore this on the first day of school last week, I told the kids I made it and they oooh’ed and aaahh’ed. Gotta impress them early! My new students are wonderful btw, I am super excited for the rest of the school year. But back to the dress, I definitely suggest you try this one. I think it is a great one for all ages, and the maxi version would also be super cute in a nice light flowy material. This one is a keeper people!!! Really, really cute! I love this on you! Very nice. Just finishing my saltspring with the sew along. Use a most fussy slippery drapy fabric…good to know it looks good in a cotton. Will have to try that next. Great color & fabric too! Another success in your corner! Love the dress and being able to eliminate the zipper is a bonus! The print looks great on you! Ooooh, ahhhhh, I must echo your students here. This is my favourite version of the Saltspring I have seen! Very pretty. Thank you! My kids ask me everyday now if I made my outfit, they are so cute. I think I may whip out another one of these before fall rolls in. Thank you! It really is, I mean who doesn’t like an elastic waistline? More room for eating! Haha thanks! I saw so many people say they thought the straps were too long but I just made them thicker and tied long bows. I think the length is good! That is a perfect summery dress. Looks very cute on you and pockets?! I love pockets. As always, great fabric choice! Love your version of this dress. 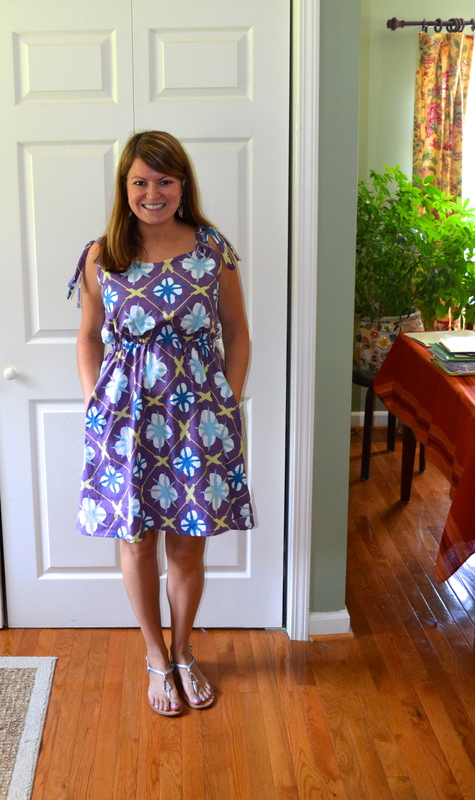 I took inspiration from the Saltspring dress and made another vogue 8870 with single tie straps. I still think I should try this pattern though. Oh I love that one, I made it a while ago in a slippery satiny material. Tie straps are a great idea for that dress! Yes, I tried the dress after I saw yours! Oooh I’d like to see that! Welcome to the blogosphere! Thanks! once I stop making mistakes on the blog i’ll post it. Haha yeah that’s a tough one! You can handle it though, insure it’ll be gorgeous! I love the Saltspring in the cotton fabric you used. ANd I’m glad your class is great this year…I’ll find out if mine is a great class when we go back to school next week.